So we’re picking up the story on Day 1 of Dragon*Con. If you don’t know how we got here, and care about the space-time continuum, go back and read Part 1. In the words of River Song: Spoilers! For those who are just joining us now, and did not heed my words of warning, I am running on empty after an all-nighter and several preceding days of four hours of sleep a night, but the Acting Ensign Wesley Crusher Cosplay is done, and it’s accurate, down to the details. The first day of the con, I’m exhausted, but also excited. I’ve never been to Dragon*Con, and I’ve never really met a celebrity, or even been in the same room with one.1 For the last few weeks, I’ve been getting really nervous about the concept of meeting Wil. I’m not used to caring what other people think, much less a famous person. But this is different. I’m about to meet Wil Wheaton, King of the Nerds. The lack of sleep is messing with my head, and I start to worry. So to ease into this whole new celebrity experience, I decide to go to the Guild panel, but not in costume. Wil is actually more awesome in person, if that’s even possible.2 So I’m feeling better, but still nervous. I find out that Wil’s done a blog post with his schedule. I’m excited to see that he’s got such a large chuck of time today in the Walk of Fame, where you can get autographs, and he’s even doing pictures. 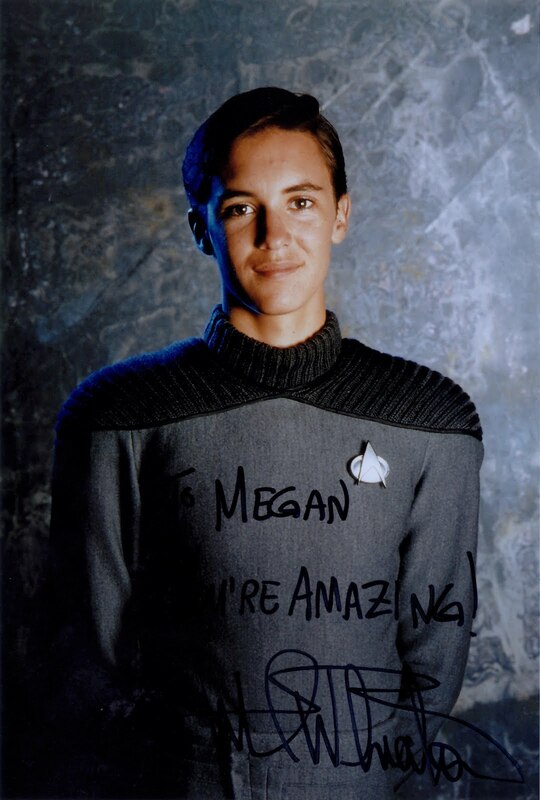 But then I read his comment about his Wesley Crusher panel, and my heart sinks. I was really looking forward to that panel. I start to over-think things, and worry that Wil might not be as excited about my costume as I am. Oh, did I mention that sleep deprivation makes me crazy? So I’m even more terrified now, but I decide to go to Wil’s signings anyways. I finish hemming my cuffs and put on my layers of padding and shaping and attempted my cross-gender makeup.3 After finishing up my transformation, I zip up my spacesuit and walk to the convention with my friend. I’m not getting any recognition as I walk to the convention, and it isn’t making me feel any better about the situation. 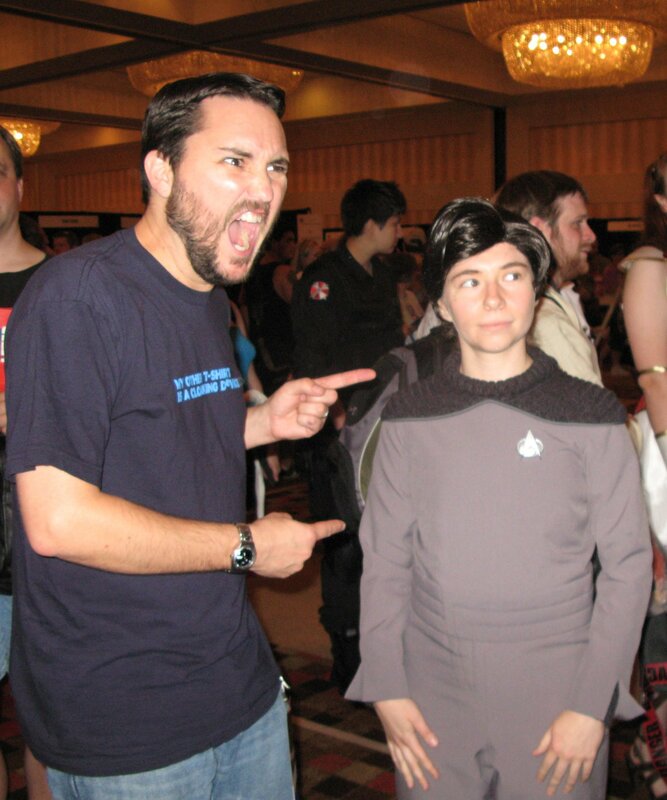 No one even comments on my costume when I finally make it to the Wil Wheaton autograph line. Which is really long. So long, that we have to go and wait outside as they take in smaller groups. So after about 45 minutes, we finally move into the main line that is inside the Walk of Fame with Wil. Since I’m so short, Wil has no chance of seeing me early. I can barely see him myself. I don’t know how he’s going to react, and I don’t know what to say to him. Finally, the couple in front of me walks away, and I walk up to the table. And then I see it hit him. His eyes go really big. I’m barely able to contain my excitement. Wil: "OMG YOU'RE WESLEY F###ING CRUSHER!!! OMG, OMG, dude, you’re amazing! this is amazing!!" As I back up and show it off, Wil is just saying “OMG, OMG this is amazing” over and over again, and I can see him register each detail in turn. If anyone knows what this costume is supposed to look like, it’s him. I’ve done all the weird seaming and stitching. That stupid giant arrow pointing to my crotch, the weird waist flaps, the piping and sweater section on the shoulders, the silver communicator, it’s all there. I didn’t know this was his pose until I saw this picture. Back to me freaking out. He comes back around and sits down again. I think the whole iPad as a PADD is hilarious, and I’m glad that Wil agrees. I dance around a bit verbally, cause as I explained in Part 1, it was, and I fixed it, and I know that “yes” is the right answer, and I don’t know how long I’ll have to explain what and why I did. Is there a timer somewhere? Is something going to buzz and I’m going to have overstayed my welcome? So I condense down my explanation to "kinda”. Wil exclaims "Then it's accurate!" Who’s the coolest nerd now, Sheldon. Megan: “So I brought this for you to sign, but just for the lolz." Wil: "Sure, what's your name?" Megan: "Megan. And I was also wondering if I could get one of these," I say, pointing to the pictures of him as Wesley in the very uniform I'm wearing. This seemed to be a much more pertinent thing for him to sign. Wil: "Why? You've done something amazing!" I just keep saying thank you, cause I don't know what else to say. I settle on confirming the photo op later. I want a nice photo with Wil. Wil: “Yeah, I am, are you coming?” He asks, genuinely excited by the thought. That meeting couldn’t have gone any better. He went completely crazy over me. All the tired-crazy is gone, and replaced with what-in-the-world-just-happened-crazy. I go over to the Star Trek panel, and my friend takes a few photos of me next to the TARDIS, claiming this would probably fulfill someone's fan fiction desires, and I think it’s kinda funny, so I go with it. 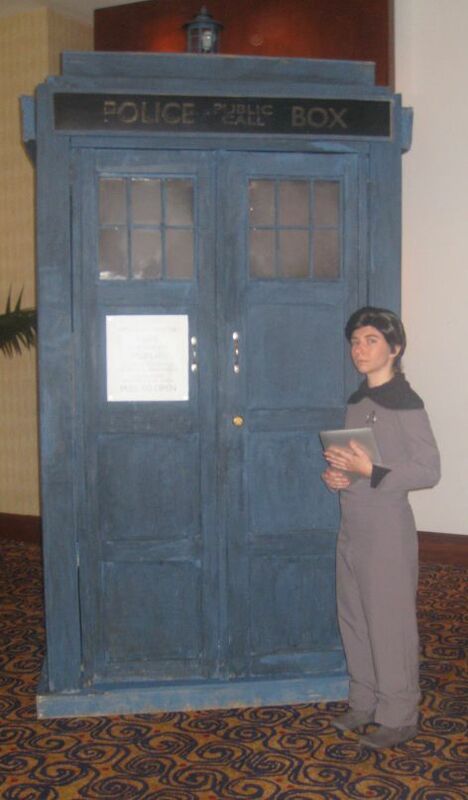 Maybe Wesley is a Time Lord. He did run off with the Traveler. 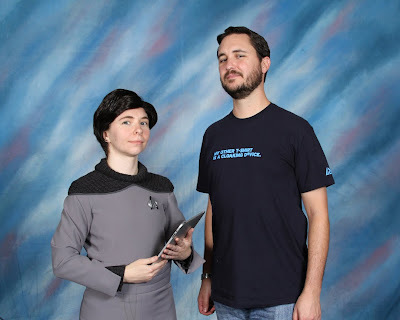 I’m not in the trek panel for very long, I had to leave early for photos, and I need to play the line game before I’ll actually get to the part where I get my picture with Wil.8 In some of these lines, I’m actually getting recognized. Maybe it’s cause I’m still riding high off my encounter of less than an hour ago, and my happy smugness is making me look more Wesley-ish. After finally ending up in the line for just Wil Wheaton pictures, they start sending us through like a conveyor belt. As I approach, Wil's face lights up again, and pointing excitedly at me, he exclaims to the photographer, "See! I told you!!" I’m so glad he’s so happy to see me again. We both stand and look stoic for the camera. I love this picture of him. He looks so smug and regal and happy all at the same time. I couldn’t ask for a better picture. Then the photographer said "Now Wil step out". I was confused, but just stood there, looking as Wesley as I could. The camera man then took a picture of JUST me. As it was happening, my brain was trying to piece together what had just happened. Wil had talked to the photographer before, and told him that when I arrived, he wanted a picture of just me. 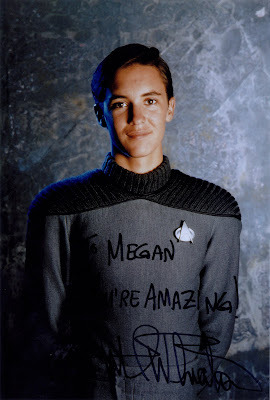 Wil Wheaton, WIL WHEATON, asked a professional photographer for a picture of me….. of ME!!!!!! Now if that doesn’t make you feel special, I don’t know what wil, I mean will. I walked around the rest of the day with a few looks of recognition, only one or two picture requests, and few to no comments. One person remarked “Oh, you’re Wesley, well, at least I liked you when you were on TV.” Honestly, I think the assumed hatred of Wesley is so pervasive that it even dampened the reception of my costume. I think I’ve started to really understand why Wil doesn’t like talking about Wesley. It was so long ago, and there’s so much negative energy around the character that it’s just really not fun to deal with. So I may not have had the kind of reactions from fellow con goers that I've grown used to,9 but Wil Wheaton went completely crazy over me, and honestly, that's the best thing that could have ever happened. 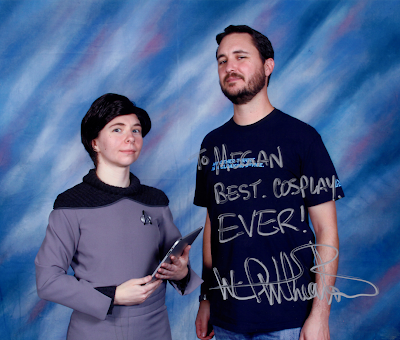 As you can see, Wil was nice enough to put up with me a second time, and sign my picture of us for me. I tried to take the opportunity to try explain away some of my crazy, saying I’d been nervous because I was unsure of how he would receive me focusing on Wesley, especially since he had that negative encounter when he arrived. To which Wil said, “You know, there’s a difference between people being a d*ck about it, and celebrating Wesley.”, and I agreed. I gave him my costuming business card. He apparently checked out my Deviant Art page that night, and told me so when I asked a question the next day in his Wesley Crusher panel. I know he was even more exhausted than I was, so it really means a lot to me that he took the time to check it out while still at the con. So Wil, if you are reading this, you totally made my convention. I hope it was as good for you as it was for me. Your panels were awesome and hilarious, and I loved hearing about your process as an actor. Your reaction on Friday was truly more than I could have ever hoped. I won the Wil Wheaton Award of Amazing, and that’s the best award I've ever received. 1 Ok, that’s not quite true. I met Mary Elizabeth McGlynn, the voice of Motoko Kusanagi from Ghost in the Shell, and Richard Epcar, the voice of Batou, but they were at this tiny con of like 300 people, and it was just a much more intimate and less intimidating setting. Also, I met Bob Ballard when I was about 14 when we took him to the airport after he’d given at talk at the university my parents work at, but I was too young to really know what to say. What do you mean you don’t know who Bob Ballard is? He discovered the mid-Atlantic vents and dozens of new species of plants and animals that use a method other than photosynthesis to survive. Also, he found the Titanic. 2 Also, Amy is super nice and a bit shy, which is hilarious to me, considering she plays Tink. Robin is like a more reasonable version of Clara, which is also awesome. Amy, Robin, if you are reading this, this is what I wanted to say to you guys in the Guild Autograph Line, but it was the end of the con, and I was exhausted, and I just forgot everything I was going to say once I got to the front of the line. Sorry. 3 I rarely wear makeup, so doing makeup for my costumes is not something I’m very good at yet. 4 Wil doesn’t touch people at cons because he doesn’t want to get sick, which I totally respect, despite my overwhelming desire to hug the living daylights out of him. 5 After the recent episode of The Big Bang Theory, having this action figure seems much more pertinent as a fan of Wil Wheaton. 6 This was the most important thing he said to me. For him to say he’d never seen anything like this before, and that he was totally blown away was more than I could have ever hoped for. I still remember the genuine tone of his voice when he said this. 7 Froggie is the name of the photographer, apparently. 8 If you’ve never been to a con, there are a lot of lines. 9 I've made some pretty impressive costumes, and yes, it can go to your head. I am so jealous. You cosplays really are amazing!